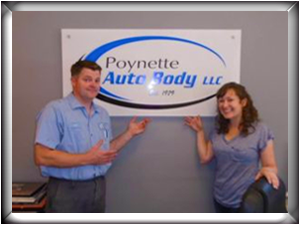 From filling a rock chip to replacing your windshield, Poynette Auto Body is equipped to remedy your auto glass needs. As a rule of thumb, a rock chip smaller than a quarter can be easily and quickly filled. One exception is when the rock chip is in the driver’s viewing area. The National Glass Association (NGA) standards do not allow for repairs in the driver’s viewing area due to possible distortion. If this is the case, the windshield would need to be replaced. If you need your windshield replaced, give us a few days to order and pick up the glass. On day of installation, allow for a minimum of two hours for the work to be done.